"My ambition is a Foreign Office that is the best diplomatic service in the world"
Foreign Secretary William Hague talked of launching the biggest drive the department has ever seen to enhance the cutting edge abilities and diplomatic skills of the Foreign Office and to strengthen the UK's diplomatic network overseas. 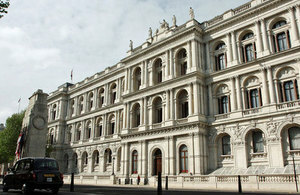 Second, we have restored financial stability to the Foreign Office, which had been tottering on a financial precipice. “In twenty years time, diplomats who join the Foreign Office today will have had a greater opportunity than ever before to build up and retain real expertise in countries, regions, issues and languages, getting under the skin of places of importance or potential importance to the UK.